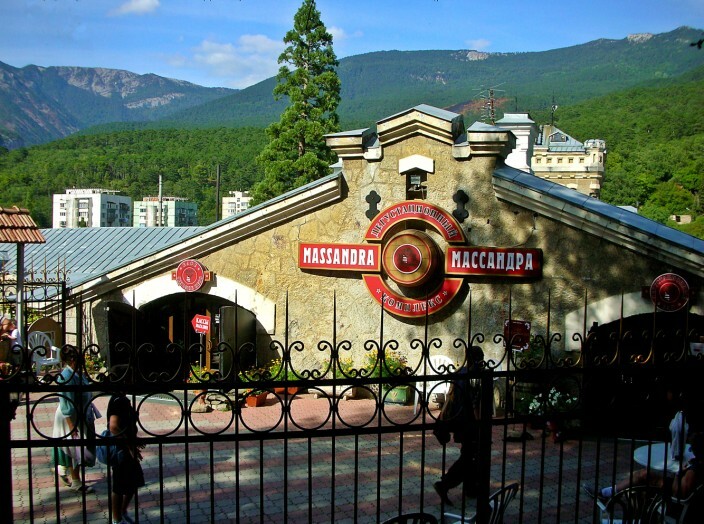 If you’re a wine lover, you won’t want to miss the famous Massandra winery, located just a few miles from Yalta in the small town of Massandra. The Mediterranean climate of southern Crimea, with long, hot summers and mild, wet winters, is ideal for viticulture, and you will find vineyards covering many of the slopes throughout the coastal region. Massandra is the largest winemaker in the country and to date has produced over one million bottles. 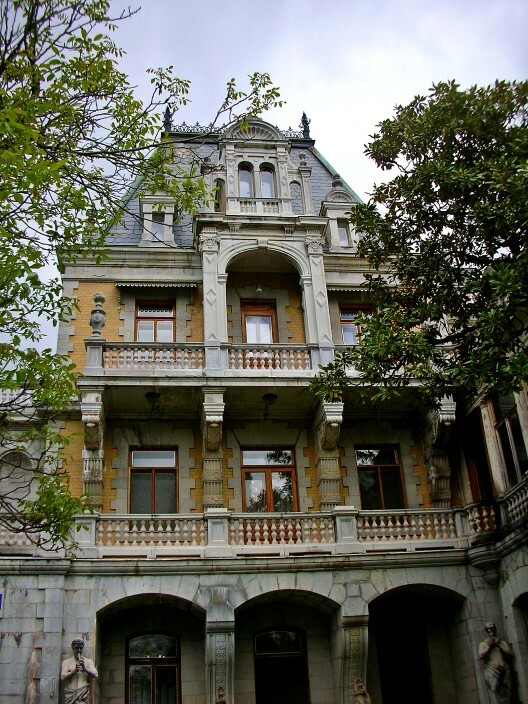 The main plant, which we visited, has been in continuous operation at this location since 1897. 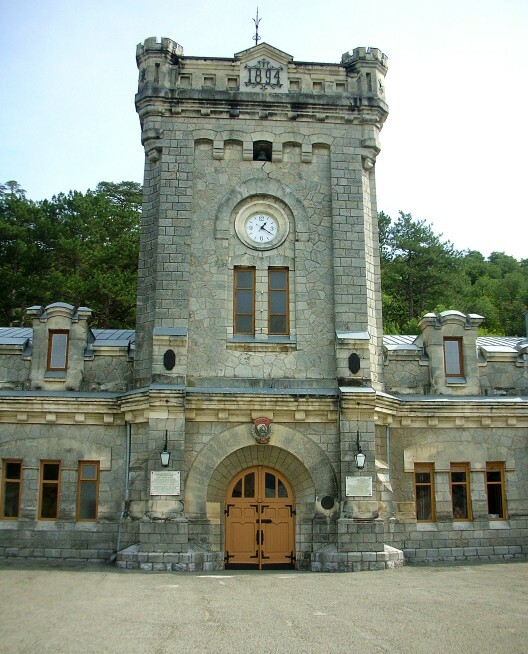 We took one of the local buses from central Yalta to Massandra, a short trip of about ten minutes, then hoofed it up a fairly steep hill from the bus stop. If it’s a hot day, as it was when we went, by the time you reach the winery you’ll be ready for a drink, or two or three. We took a tour of the winemaking facilities which was informative but nothing you wouldn’t get on any winery tour in the U.S. What was impressive was the tasting. Unlike most wineries I’ve visited in the states, where you stand at the bar and get a few niggling samples from perhaps two or three wines (four if you’re lucky) at Massandra it’s a real production. 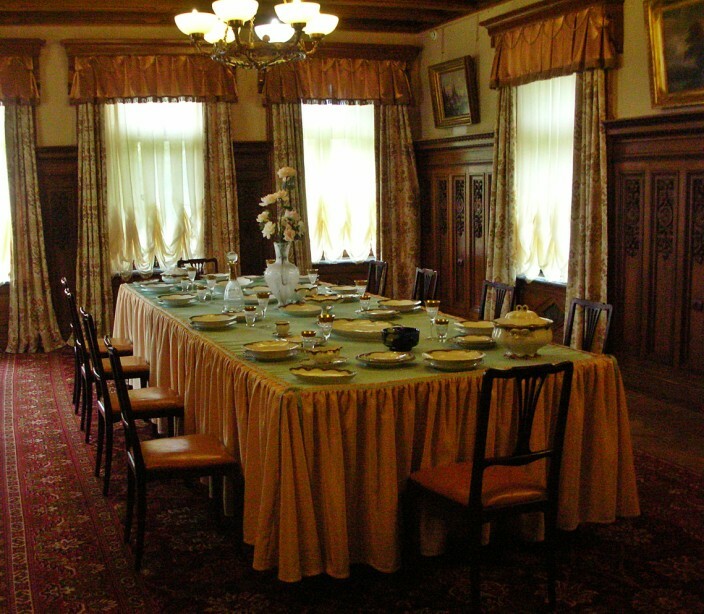 They take you and fifty or sixty other guests into a large conference type room where you are seated at tables with a tray of ten (10!) wine glasses at each seat. Each of the wine glasses holds a good ounce or more of wine and is clearly labeled. But don’t touch that wine yet, no sirree, not until you’re told to or you might get your hand slapped. They run 50,000 guests through here annually, so the whole thing is highly organized and very smoothly operated. The hostess stands in front of everyone and begins her spiel, first telling you some history of Massandra winery and the region, some of the famous folks who’ve graced their facilities, yadda yadda. For me it all brought back bad memories of many a college lecture, the professor droning on and on about some dreary subject while the students (me) struggled mightily to stay conscious, often unsuccessfully. Of course, it didn’t help that this particular lecture was all in Russian. Irina said it was actually very entertaining and informative, but frankly I just wanted to drink some wine. Finally we got to. The hostess indicates when it’s time to drink glass number one and everyone sips it while she tells you all about that wine, the grapes, which field it came from, and then this process is repeated nine more times. If you like sweet wines, this is the place to go. 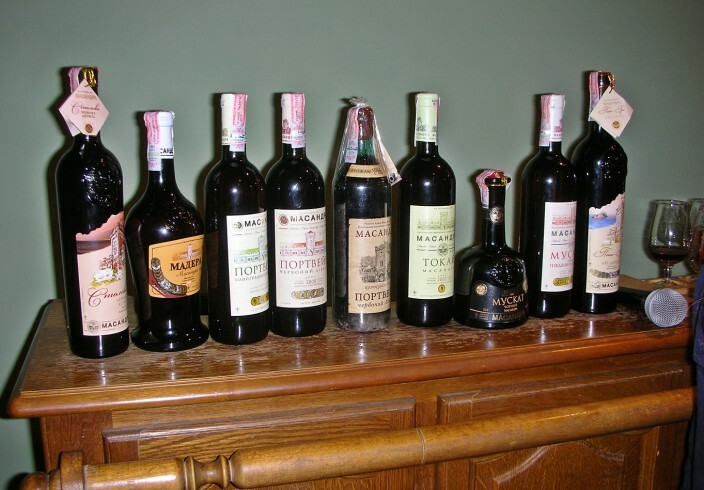 They had one or two Ports, Tokay, Sherry, Muscat, and Cahors among others. I’d rate six of the wines we tried from mild toothache to gag-a-maggot on the sweetness scale, a couple others at medium-sweet to medium-dry, and two dry reds. 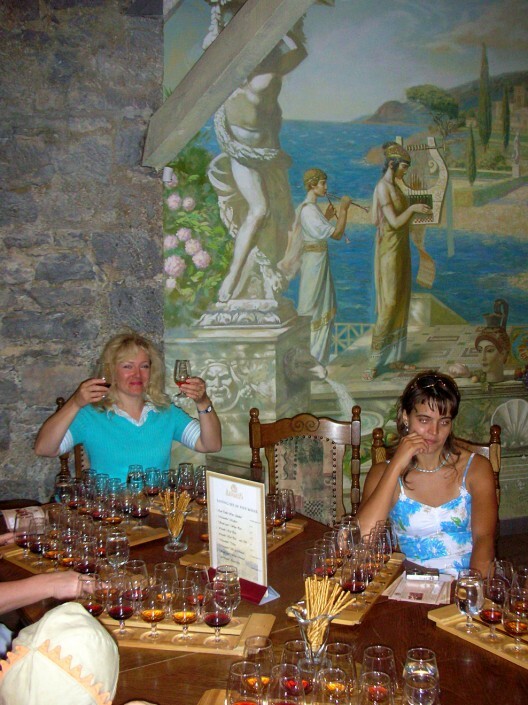 For Irina – and everyone else, judging from their reactions – this was wine heaven. 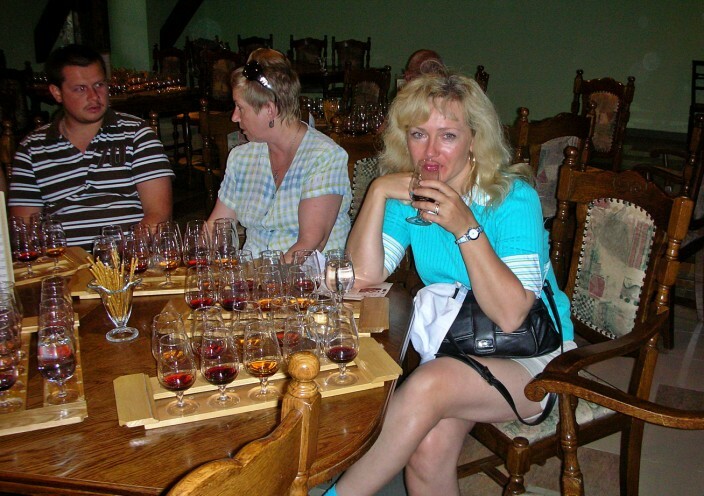 In Ukraine most of the wine produced is sweet, and drunk as either an apertif or an after dinner dessert, and that’s how the wine drinkers there like it. Good for them. I’m more a Dago red kind of guy, so the majority of the wine was way too sweet for me. However, I did try them all and finished most of them and when I stood up – the whole thing lasted about forty minutes – I was glad to be walking and not driving. I have to say that for sweet wine it is very tasty and well crafted, in fact some of the best dessert wine I’ve ever tried from anywhere. 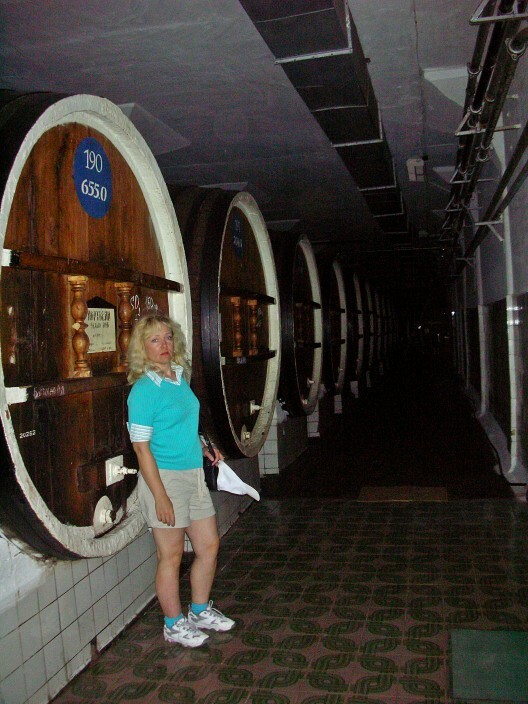 I also liked one of the dry reds – a light, fruity number – enough to buy a bottle and pack it in the suitcase to bring home, where it was kept company by several bottles of Ukrainian vodka which you can’t buy in the U.S. 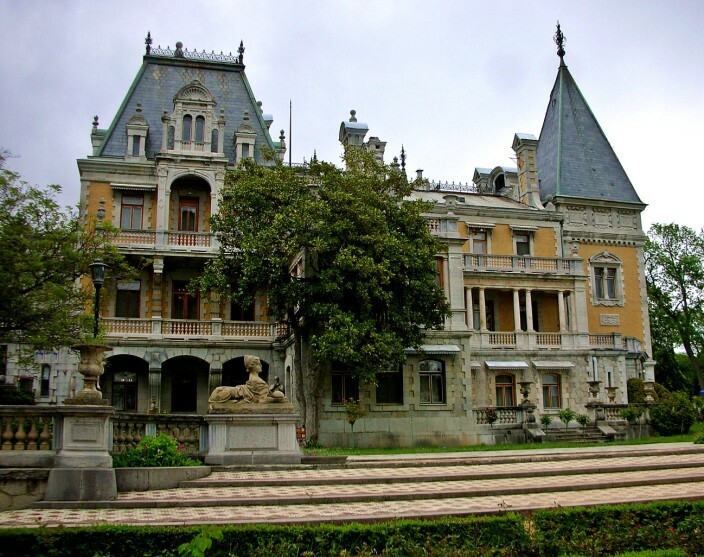 If you’re in the Massandra area for the winery, you’d be crazy not to also pay a visit to the Massandra Palace, one of the Big Three palaces of the greater Yalta region, the others being Livadiya and Voronsovsky. Of the three, I’d rate Massandra Palace a definite third place in all around interest and beauty, but that’s a bit like choosing between three lovely sisters, one blonde, one brunette, and one redhead: very subjective, and you want to try each of them if humanly possible, though maybe not all in the same day. I could extend this metaphor but I think it’s run its course. 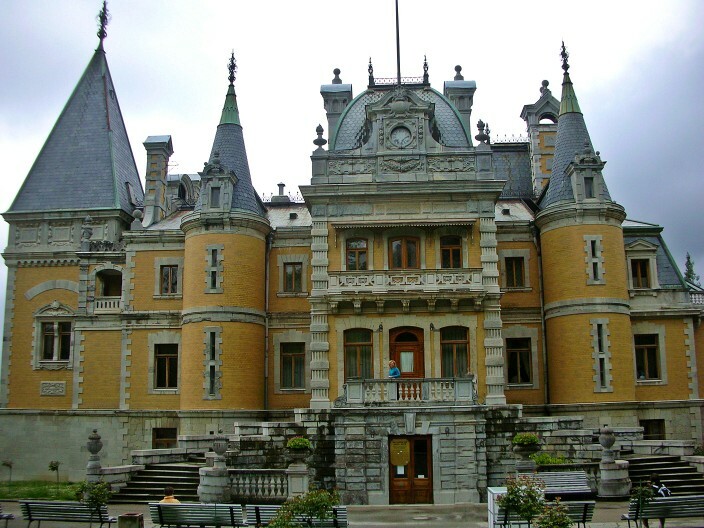 Much like the winery, reaching the Massandra Palace requires some uphill legwork from where the bus stops, unless you are taking a private taxi, of course, which will drop you at the gate. From where our bus left us it took about twenty minutes of decent paced walking, some of it fairly steep and with occasional watch-your-back curves where there is no sidewalk and cars can suddenly come whipping up or down the hill as you are forced to walk on the shoulder. 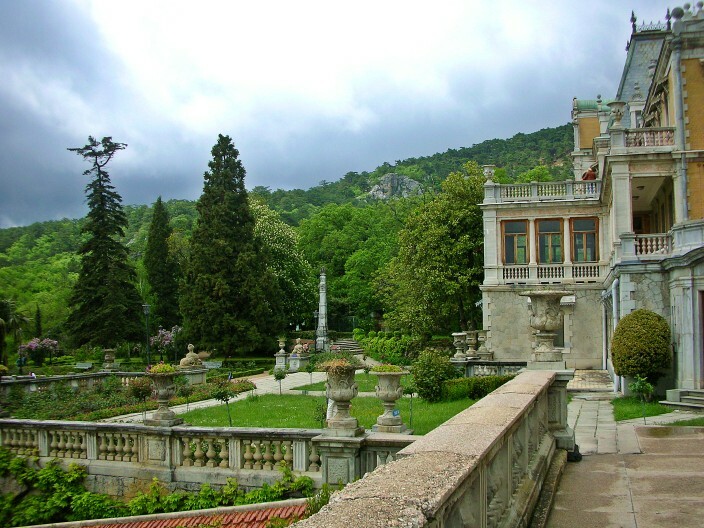 The grounds of the palace cover several acres, and as you approach it along a meandering pathway bordered by tall grass and dotted with trees, you get a good view of the main building set back on the high ground. 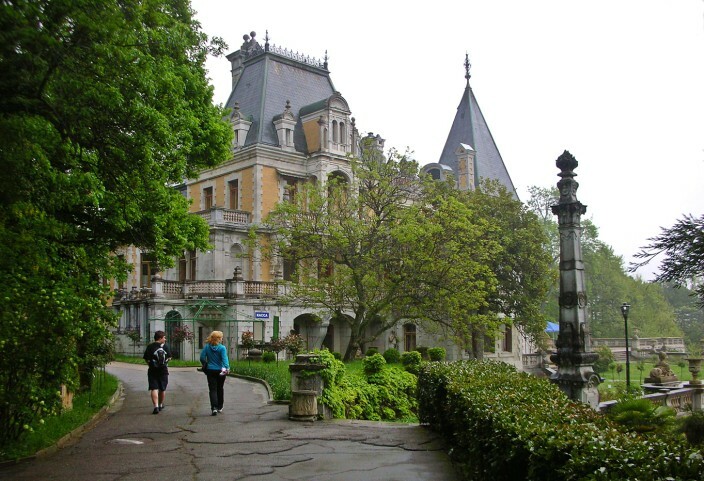 Massandra Palace was built in the late 1800’s for Prince Voronstov in the style of a French hunting chateau. 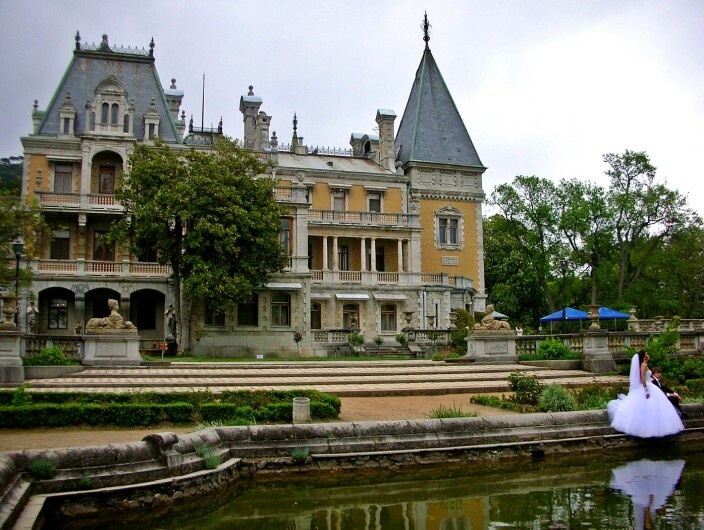 But what it’s really famous, or infamous, for is that it later became the summer dacha of Stalin, although that’s stretching the definition of dacha considerably. For the average Russian a dacha is nothing more than a glorified one room cabin in the woods used for an occasional weekend getaway. You could hardly mistake the opulence of Massandra for somebody’s country cabin with an outhouse. For me the most striking feature of the place is the mismatched double peaks of the roof. One is like a four-sided, pointed witch’s hat, the other wider and chopped off halfway up with a flat top. Try as I might, I just can’t find this asymmetrical look aesthetically pleasing in any way. Every time I see it, it reminds me of a bactrian camel with one of his humps half missing. I wonder, did they run out of money halfway through construction of the flat-top tower, or did some dolt of an architect convince the original owners that this was the way to go? All I can say is this proves once again – if it still needs proving – that being rich is no guarantee of good taste. 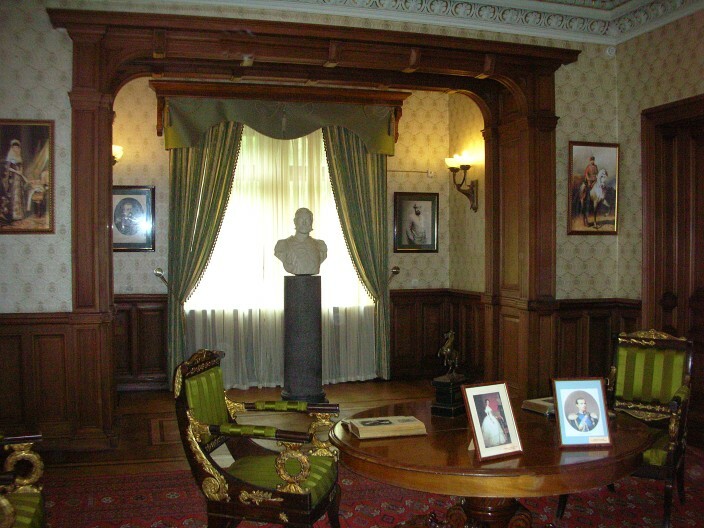 Inside the palace, you get a nice guided tour of the first two floors. Like most of these places, it basically amounts to a 19th (or 18th or whatever) century “Lifestyles of the Rich and Famous” walk-through and always brings out the latent socialist in me (an admittedly microscopic piece) with regard to why these nobles really needed these monuments to greed built on the backs of the poor downtrodden peasants, blah blah blah. Then, thankfully, before I get too worked up, common sense reasserts itself and I realize it has always been thus. Do you think the pharoahs really needed a tomb the size of a small moon in which to rest their bones eternally? Probably not, but there’s your pyramids still standing in proof that no one race or nationality has ever cornered the market on human pomposity, egotistical arrogance, or an overinflated sense of self-importance. Well, clearly I’ve watched too many late night movies and shouldn’t be allowed to roam the corridors of their mansion unsupervised, which they made sure of. 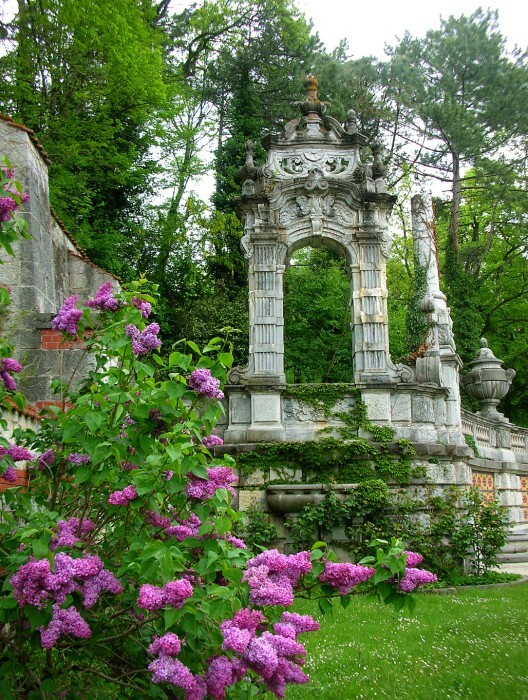 All through the tour, our every step was scrutinized by docents strategically positioned along our path waiting to pounce should you place a finger wrong or, God forbid, breathe too heavily on some ancient piece of overdecorated frippery. I took delight in lingering behind the main body of our group, taking pictures, smiling and mumbling to them in English when they scolded me in Russian for some imagined transgression. In many ways I found the grounds and view of the palace much more interesting outside than inside. It’s well kept, with modestly sized flower beds and a small wading depth pond out front suitable for postcard photos, exactly the sort of place I could see Inspector Clouseau arriving in his vintage sixties Peugeot, stepping out and slamming the door before doing a pratfall into the water. No such hilarity ensued while we visited, although there was a lovely young couple having their wedding photos done with the palace as a backdrop, and while they perched precariously on the pond edge I couldn’t keep myself from hoping for a Clouseau moment which, unfortunately, never happened.